Dry rot does not occur from the deck being too dry, despite what the name implies. One of the most common foes of decks throughout the state of Maryland is dry rot. Dry rot does not occur from the deck being too dry, despite what the name implies. Dry rot is a fungus that happens when there is excess moisture on your deck. It leads to mildew, staining, mold, and decay over time. Protecting your deck from dry rot is the best way to prevent it from doing a lot of damage. 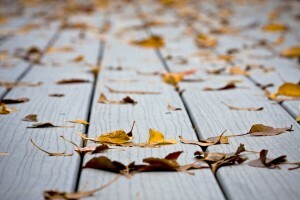 Here are our best tips for preventing your deck from dry rotting. Dry rot is typically gray in color and it covers the entire deck surface in sheets of mold or fungus. In some cases, your deck will appear to be dark and decaying. In other cases, it might simply appear as a mold growing right on top. Many times, dry rot on a deck attracts other pests, like termites, so you might have more than one problem happening at a time. It’s always a good idea to contact a professional when you have a problem with dry rot. Work with a home inspector to walk throughout the exterior and interior of your home to try to identify dry rot. It can happen under sinks, around windows, and even on door frames. It is very common outside thanks to the increased moisture level. The dry rot on your deck might also get to the foundation of your home, so you should always work with a professional. Identify any leaks or water sources that could be contributing to dry rot inside or on your deck. Check your gutter system to ensure that it isn’t depositing excess water on your deck. Where is your sprinkler system? If it is hitting your deck instead of your lawn, it’s time to reposition. By paying attention to the amount of water that your deck encounters on a daily basis, you can prevent dry rot.